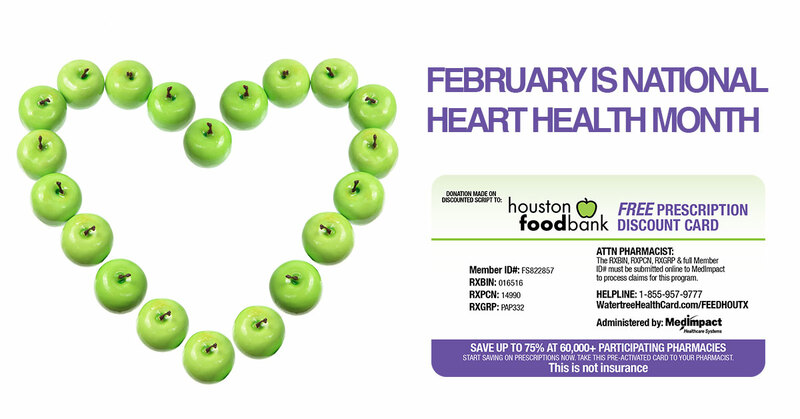 Watertree Health and Houston Food Bank promote healthy hearts while providing nutritious meals during National Heart Health Month. Heart disease accounts for almost 28% of Houston area deaths each year. It's National Heart Health Month — a time to review how high blood pressure, high cholesterol, and other heart-related illnesses affect tens of thousands of people living in Houston. Heart disease accounts for almost 28% of Houston-area deaths each year, and recent reports have shown that the rising costs of the prescriptions taken monthly to treat this chronic ailment have become too high for many people, even for those individuals with health insurance. To help address this issue, partners Houston Food Bank and Watertree Health® introduced tools to help people in their communities get affordable heart medications — the GPS Rx-price-lookup-tool and a texting code to immediately get a free Prescription Discount Card. As an added benefit, every time a person saves using this special card benefitting the Houston Food Bank, Watertree Health makes a donation to the organization to help fight hunger in their local areas. Watertree Health introduced GPS to help people easily find the most up-to-date discounted prices on their prescriptions using the card, at pharmacies close to them — wtree.us/savingstool. By using the free Prescription Discount Card, individuals in Houston can save as much as 82 percent off the full retail price for Diovan and Simvastatin, two of the medications regularly prescribed to treat high blood pressure and high cholesterol, respectively. Texting for a card allows people to save money on their prescriptions when they’re at the register. The message provides pre-activated codes and card image that can be presented to the pharmacist for immediate discounts. The card saves users up to 75 percent off prescriptions. Eligible Rx medications include those frequently prescribed for heart, hypothyroid, stomach acid, asthma, migraine and other common ailments. It is accepted at over 62,000 pharmacies across the country including local, regional and national chains, such as Kroger, CVS, Walmart, Target and Walgreens. The card can be used by people with health insurance to complement their plans—to help fill in gaps of prescription coverage—or by the uninsured. To get a card, visit: WatertreeHealthCard.com/FEEDHOUTX or text FEEDHOUTX to 95577. The card image in this story can also be presented to the pharmacist to obtain Rx savings. For more information about the card, watch this short FAQ video: Wtree.us/video/FEEDHOUTX. Watertree Health was founded in 2010 to address the growing need for more accessible health care products and services in America. The Company’s mission is to help people improve their lives by improving their cycle of health. Watertree Health’s founders believe everyone should be able to afford their medicines. The Company launched the free Prescription Discount Card in 2011 to help the tens of millions of people in America without adequate prescription coverage. For more information, visit WatertreeHealth.com. In fall 2008, the Houston Food Bank merged with End Hunger Network, a Houston-area food rescue organization, thus making more effective use of community resources by working together as one. In fiscal year 2014-2015, the Houston Food Bank distributed 74,000,000 nutritious meals. The vision for the future is to expand service to the community to 100,000,000 nutritious meals by 2018. Every dollar donated to the Houston Food Bank provides the equivalent of three meals for an individual. We calculate this by dividing total meals provided by total adjusted costs, using a Feeding America formula. The number does not include the meals provided through SNAP (Supplemental Nutrition Assistance Program, formerly food stamps) benefits.